Francisco de Zurbarán was a Spanish Baroque painter who was born in 1598 in Extremadura, Spain. He was highly popular for his religious paintings of martyrs, nuns, monks and saints. He was also an accomplished still life painter. He showed his artistic skills very early in life, often imitating objects he saw using charcoal. At the age of 15 he was sent by his father to apprentice with Pedro Díaz de Villanueva, a painter in Seville. Very little is known about this artist. It was around 1625 when Zurbarán started his career in art. His first commission was to produce a number of large paintings for the Carthusians (monks) of Santa Maria de las Cuevas and the Seville Cathedral’s Retablo of San Pedro. By the start of the year 1626 he gained a contract to create 21 paintings in a span of eight months for the San Pablo el Real Dominican Monastery located in Seville. This large commission established his fine reputation. Three years later he was invited to move to the city by the Elders of Seville because of his highly-regarded reputation as a painter, in the hope that his move will have an effect in increasing the reputation of the city. Towards the end of 1629 or about 1630, Zurbarán’s popularity had increased, and he was appointed by King Philip IV to be his court painter, calling him not only as painter to the king but also the king of painters, according to a story. The association with the king lasted for about ten years. His style, which was hard-edged, harsh and austere did not fare very well against the style of the new breed of artists such as Murillo, which led to the decline of his reputation. He went to Madrid to find new work but was not that successful. He did renew his contact with fellow Spanish artist, Diego Velázquez when he was in Madrid. However, his severe composition is said to be influenced by the work of Juan Sánchez Cotán, also a Spanish Baroque painter, a pioneer in realism and very well known for his still lifes. The sophistication of polychrome sculpture, which was at its height during the apprenticeship of Zurbarán also had an effect on his painting style, especially the works of master sculptor Juan Martínez Montañés. Francisco de Zurbarán normally painted from nature directly and he was also very proficient in depicting draperies, particularly white ones. This was one of the reasons why he was so popular with the Carthusians, whose robes where made of white cloth. His subjects were mostly religious in nature, which adhered to rigid self-discipline and severity. His style was more tempered and reserved than the style of Caravaggio and the color tone he used was often bluish. The chiaroscuro effect was achieved with foregrounds that were finished with precision and largely awashed in shade and light. The largest composition Zurbarán did was the altarpiece that he created for the church of the College of St. Thomas Aquinas. This painting showed Christ, several saints, the Madonna, Archbishop Deza, King Charles V with several knights, as well as servitors, monks and other personalities. The work has been acquired by the Seville Museum of Fine Arts. 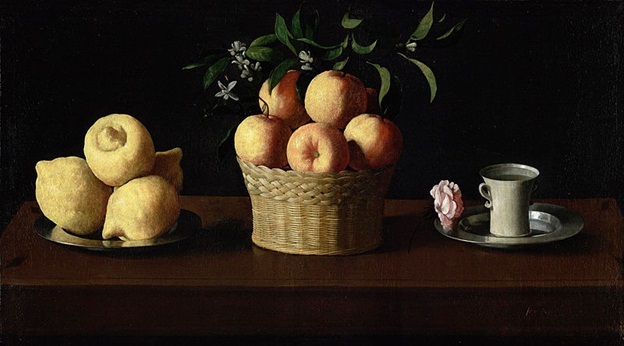 Although later in life Zurbarán lived in obscurity and poverty, during his heyday, he was able to create several paintings of exceptional quality. He created several large pictures for the Santa Monica de Guadalupe and eight of these paintings depicted Saint Jerome’s history. He painted the Crucified Savior in grisaille for the Church of Saint Paul and created the high altar paintings for the Jerez Carthusians. 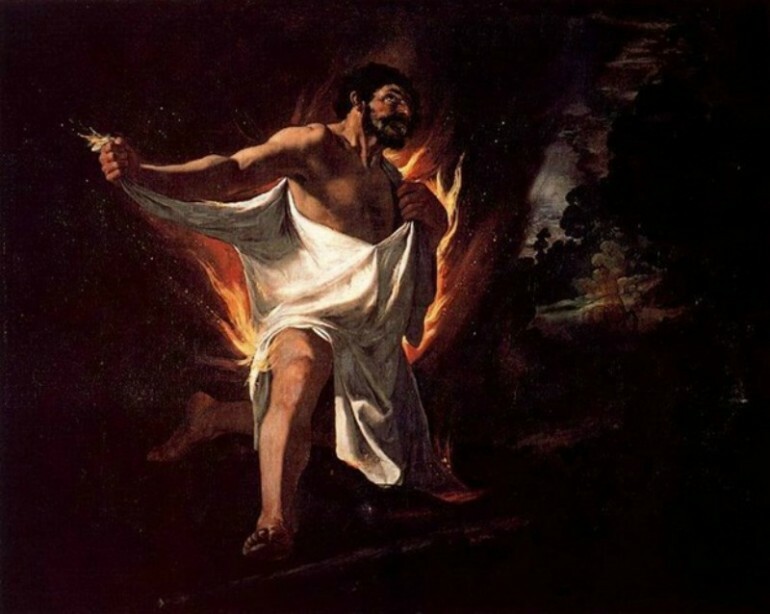 He also created ten huge paintings depicting the Labors of Hercules for the Palace of Buenretiro and a life-sized full length figure of Saint Francis shown kneeling and holding a skull (Saint Francis in Meditation), which is now at the National Gallery in London. At the Auckland Castle located in Bishop Auckland in Durham County, are 13 of the works of Zurbarán that depict Jacob and his 12 sons.